Abstract: Airwheel Technology which has been stepped on the international stage, CES 2016 has already brought its new product M3 electric hoverboard on the fundraising stage, Indiegogo to gain more backers as well as attention. Airwheel Technology, both the industry giants and small start-ups is eager to seize the opportunity to show off its products on any platforms. Lately, it has engaged in Indiegogo to display its new electric hoverboard M3 the latest products going to capture some professional player of skateboards. Electric skateboard M3 has been released by that company mentioned above. M3 can be manipulated via a hand-control wireless remote control and connected to a smart phone by a customized app. The device can top at the speed 20 km/h. Moreover, Airwheel motorized skateboard M3 has joined in the crowd-funding campaign on Indiegogo. Please visit http://igg.me/at/airwheel for more information. Only on this platform, the buyer can enjoy this favorable price $399 to take one. The two big events sign the ambition of that scooter company to push M3 to move toward the international stage. 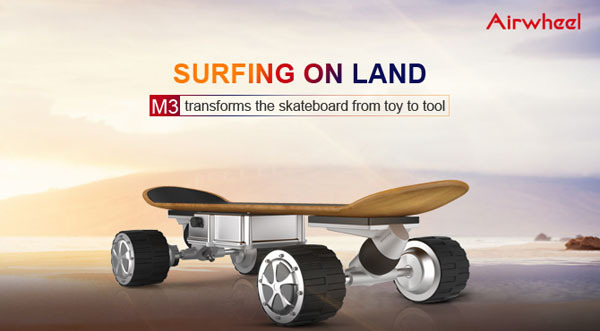 As an eco-friendly product which integrates recreational, fitness and practical functions, M3 is going to arouse a big wave in the skateboard market. Although M3 is not the unique product in the market, it is a good example to challenge the tradition with the strengthened functions and quality. M3 electric board has double circuits and double battery protection boards. Dual-core drive and protection system ensure its safety performance. The battery management system gives over-discharge protection, overcharge protection and short circuit protection which has absolutely eliminated the battery failure risks. There is a battery main switch which helps to save power when not in use. All these features with M3 are making itself excel from other peers on the international stage. It's a cost-effective skateboard at Indiegogo. M3 is worth your attention for its unique features. Next：At CeBIT 2016, visitors can experience Airwheel latest self-balancing electric hoverboards.